The Holst Centre and Rolic Technology have entered into a research partnership on protective moisture barriers for flexible electronics applications such as OLED and OPV. Rolic will develop new materials that will enable commercialization of of high-end flexible barriers and solutions for improved light out-coupling. The Holst Centre aims to develop this thin film barrier fabrication technology for sheet-to-sheet (S2S) application as well as roll-to-roll (R2R). The focus of this projects seems to be OLED lighting, but this will also apply to OLED displays and OPV panels. 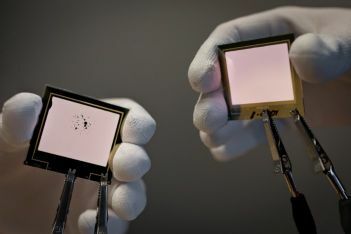 In the photo above (sent by the Holst Centre) you can see an OLED panel with black spot defects (left), and the same panel, protected by a thin film barrier, without defects. The panels themselves are Philips Lumiblade OLED lighting panels, made on rigid glass. Just a few days ago we reported that Plextronics and the Holst Centre are going to partner on research towards flexible OLED lighting, with an aim to improve the scaling of lab device performance to large area OLED lighting and signage devices.